Langston Coleman said “Luck is what you have left over after you give 100 percent.” The College of Eastern Utah men’s basketball team played hard, and were rewarded by lady luck with two big wins over North Idaho College, and the College of Southern Idaho. The Eagles also racked up wins against Western Wyoming Community College, and Colorado Northwestern Community College, before dropping two games at home against conference rivals Salt Lake Community College and Snow College. On Dec. 4 CEU took on the then No. 2 ranked team in the nation, the NIC Cardinals. The Eagles came into the game ready to play, Head Coach Chris Craig said, “NIC was no. 2 we didn’t have to motivate them a whole lot.” Emotions ran high in the first half of the game, and Ewek Emeka of NIC was ejected following a flagrant foul. CEU went into the locker room at halftime with a one-point lead 37-36. The second half was back and forth, with both teams fighting hard for a win. Michael Glover played well for the Eagles, and treated fans with great plays, including a finger roll in the first half, where he cut through the NIC defense and seemed to float in the air as he finished a perfect layup. Glover led the Eagles in scoring with 15 points. The Eagles pulled out a big win, upsetting the Cardinals by the score of 104-94. With the win CEU climbed up to 24 in the National Junior College Athletic Association standings. The next night the Eagles played host to the CSI Eagles. CEU came out sluggish and started off slow, with CSI jumping out to an early lead. Coach Craig said “that’s one of the problems with our team, we start slow and I need to do a better job to make sure they are better prepared … at the jump ball we’ve gotta [sic] go to war.” At halftime CEU took a 45-40 point lead into the locker room. The game was back and forth for much of the second half. With seconds left in the second half, CSI looked poised to win, but luck was on CEU’s side. CSI was plagued by mental mistakes late in the game, including a late foul that sent Isaiah Williams to the line to tie the game. CSI had a two point lead with seconds left when Vander Juaquim blocked a shot, and got the ball down court to Aaron Hawk-Harris. Hawk-Harris missed a pull-up jumper but Jonathan Mills was there for the put back to tie the game. In overtime the Eagles took control of the game, and came away with a 104-94 win. Glover once again led the Eagles in scoring with 23 points; he also pulled in seven rebounds. CEU continued their long home stand when Western Wyoming came to town Dec. 8. The Eagles dominated from start to finish against Wyoming and by half time they had a 37-29 lead. For the third game in a row, Glover lead the Eagles in points with 14 points, Vander and Tony Dalton also contributed 12 points. The Eagles were too much for WNCC and won the game 84-52. Following the win against WNCC the Eagles took the next few weeks off for the holiday season. When CEU returned to action, they traveled to Rangely, Colo. where they took on the CNCC Spartans. Williams lead CEU in scoring with 27 points and the Eagles had four players in double digits. Mills had 14 points, Glover once again turned in a strong performance with 18 points, Joaquim chipped in 11 points. The Eagles dominated the game and went on to win 101-80. 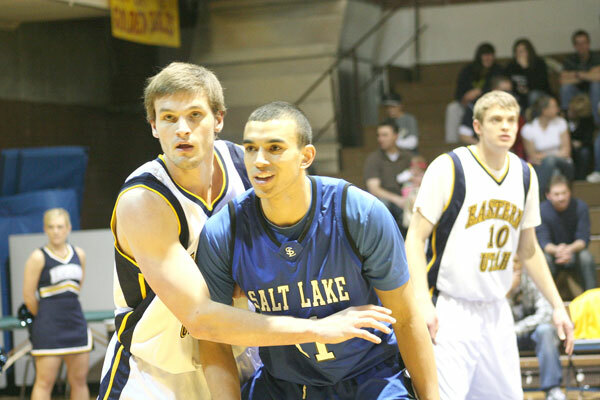 Following the loss against SLCC, CEU took on arch-rival Snow College the next night. The Eagles once again started slow, with SC jumping out to an early lead. But CEU kept it close and by halftime the Eagles were down by seven, with the score at 37-30. In the second half, the Eagles battled back to make it close, but in the end couldn’t pull out a win against Snow. The final score was 83-80. Coach Craig said about the loss that it was “unacceptable. We lost because of bad effort. It’s my responsibility.” Glover led the Eagles with 24 points, and nine rebounds in the loss. The Eagles now hold a 12-5 record, and are tied for first place in the Scenic West Athletic Conferance with a 6-2 conferance record. Following the weekend of play, NIC is ranked 14 in the nation, and SLCC is ranked 25. CEU dropped out of the national rankings following their two SWAC losses. After a stretch of home games, CEU heads on the road where they will take on CSI in Twin Falls, Idaho on Thursday, Jan. 14, and NIC in Coure d’Alene on Saturday, Jan. 16 before returning to Price where they will face CNCC on Saturday, Jan 23 at 5 p.m. in the BDAC. Correction: I would like to apologize to Cliff Colomon for mistakingly refering to him as Cliff Coleman in previous issues, I now know it’s Colomon.